Citrus Shrimp Couscous Salad with Israeli (pearl) couscous, shrimp, olives, onion, avocado, tomato, and a light dressing of orange, lemon, and lime juices. Prepare couscous according to package instructions. Drain if needed. Stir in olive oil, salt and pepper. Cut away peel and white pith of the oranges. Working over a large bowl, cut out and drop orange segments along with any juices into the bowl. Squeeze juice from membrane into the bowl. Discard membrane. 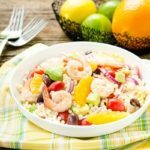 Add lime and lemon juices, shrimp, tomatoes, avocado, onion, olives, and cooked couscous. Gently stir to combine. You can make the salad a day in advance and chill until serving. If so, wait to add avocado until just prior to serving.